George Ivanovich Gurdjieff (January 13, 1866 – October 29, 1949) was an inﬂuential spiritual teacher of the early to mid-20th century who taught that most humans live their lives in a state of hypnotic “waking sleep”, but that it is possible to transcend to a higher state of consciousness and achieve full human potential. Gurdjieff developed a method for doing so, calling his discipline “The Work” (connoting “work on oneself“) or “the Method”. According to his principles and instructions, Gurdjieffs method for awakening one’s consciousness is different from that of the fakir, monk or yogi, so his discipline is also called (originally) the “Fourth Way”. At one point, he described his teaching as being “esoteric Christianity”. 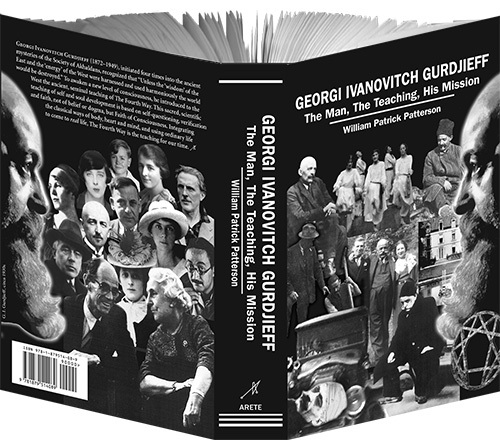 “Georgi Ivanovitch Gurdjieff: The Man, The Teaching, His Mission” represents William Patrick Patterson’s ninth and final book on the life and teachings of Gurdjieff and is fundamentally a summation of forty-four years of Patterson’s researching, studying, and applying Gurdjieffs ‘Fourth Way’. An impressive work of deﬁnitive scholarship, “Georgi Ivanovitch Gurdjieff: The Man, The Teaching, His Mission” is enhanced with photos and essays, as well as extensive Notes, a Chronology, lengthy roster of References, a list of Gurdjieff Students, and impressive Bibliography, and a comprehensive Index. A critically important resource and reference for students of Gurdjieffs work, “Georgi Ivanovitch Gurdjieff: The Man, The Teaching, His Mission” is an indispensable addition to academic library reference collections. For more information on Georgi Ivanovitch Gurdjieff – The Man, The Teaching, His Mission visit The Gurdjieff Legacy Foundation.